This timely volume examines resistance to natural resource extraction from a critical ethnographic perspective. Using a range of case studies from North, Central and South America, Australia, and Central Asia, the contributors explore how and why resistance movements seek to change extraction policies, evaluating their similarities, differences, successes and failures. A range of ongoing debates concerning environmental justice, risk and disaster, sacrifice zones, and the economic cycles of boom and bust are considered, and the roles of governments, free markets and civil society groups re-examined. 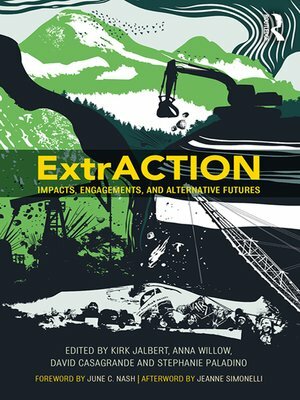 Incorporating contributions from authors in the fields of anthropology, public policy, environmental health, and community-based advocacy, ExtrACTION offers a robustly argued case for change. It will make engaging reading for academics and students in the fields of critical anthropology, public policy, and politics, as well as activists and other interested citizens.